How much Yen should I bring? How much Yen can I bring to Japan? 10,000 - 20,000 Yen. JR train and Taxi were unable to accept any credit cards. The process of credit card takes time. You may want to say I will pay in cash. If you don't have any Japanese money you can't get out the airport. The airport has an bank to exchange the foreign currencies to Japanese Yen. But it will be tough to find out the such facility at unfamiliar airport taking your heavy luggage. It is much easier for you to prepare Japanese Yen in your country at your local bank or departing airport using your language!!!!! If You forget to get Japanese Yen, following facility is available at airport. The actual exchange rate from each currency to Yen is worse than this chart. Actual buying rates vary at dealers. To get current rate, please refer to the latest conversion your currency and yen. Please click the following company if you need Japanese Yen. Order foreign currency online, it's fast, easy save time and money! How much yen should I bring to Japan? How much yen do I need a day? This is the question everyone wants to know before any action. It is really tough to find the right budget at a general level. Are you on business or pleasure? Trip on business may needs much money. Here are several information about money and it will help you to understand how much yen you need in Japan. You can get some idea about the prices in Japan. These prices is just reference and there is no limit of price on the most expensive item. Withdraw Japanese Yen at convenience store? 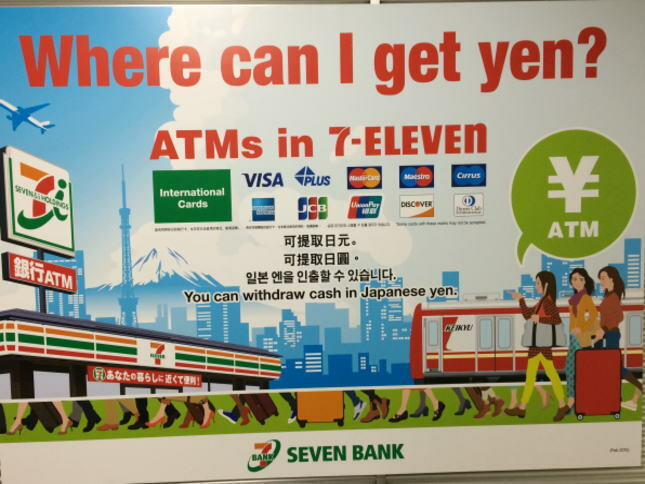 You can withdraw your money in Japanese Yen at Seven Eleven convenience stores. Seven bank is one of the banks which have started the bank business from retailer business. They have over 20,000 ATMs at 17,500 Seven Eleven stores. You can withdraw Japanese Yen using these ATMs. Service hour is almost 24 hours. It would be really helpful and reliable in some case. You can withdraw maximum 100,000 Yen at the store. Some cards can pay 200,000 Japanese Yen. The service charge might be applied by your credit card company. The key is your credit card is ready for the international use. Do you remember 4 digit secret numbers(PIN, Personal Identification Number)? If you don't have the PIN number on your credit card, it is good to set the numbers before your departure. Check your credit company first of all whether your card is ready for an usage in foreign countries.. If you want to bring one million Japanese Yen or more than it to Japan with you, you need to declare at custom office. This regulation is applied to the total amount of cash (total amount of any currencies), travelers check, gold and etc. Less than this amount you don't need any process. You don't need any tipping for special services. No tipping for a doorman. No tipping for a bell captain. No tipping for a porter. No tipping for a waiter and a waitress in a restaurant. No tipping for a taxi. You are free of warring Tipping in Japan. but in this case the service fee is included already in your bill. Hotel bell person never accept your offer of tip. In special occasion, you may give some money for the best hospitality for taxi driver or Ryokan maid.